As phone technology improves dramatically in recent 2 years, there are more services and featured added to the latest model to attract people to purchase the device. However, the #1 and #2 use of a phone are still calling and SMS messaging, which never changed since the released of the first phone. These two usages of a phone become the most essential part of every person's life. Nowadays, there are a lot of people having more than one phone at the same time or switching phones from time to time. So, it will be very frustrated if we cannot have all of the messages transferred to our new phone. Since the SIM cards vary in sizes, we can't pull out the SIM card from a LG phone and insert it into the new iPhone directly. Is there a simple way to transfer messages from LG phone to iPhone and won't cost that much? Of course! You just need to download Phone to Phone Transfer in your computer and then, you can transfer all your precious SMS from your LG phone to iPhone. Phone to Phone Transfer is a small but useful program, which allows you to transfer data (text messages, photos, videos, music, contacts, apps, call history, calendars and many more) from LG Android phone to iPhone, or from iPhone to LG phone. It also supports other Android and Symbian phones, including Samsung, HTC, Huawei, LG, Motorola, Sony, Nokia and so on. Supported iPhone Models: iPhone X, iPhone 8/8 Plus, iPhone 7 Plus/ 7, iPhone SE and iPhone 6S/6/5S/5. Supported LG Smartphone: LG G6, LG G5/G4/G3/G2, LG V30/V20/V10/K10//K5/K4/K8, G Flex 2/Flex , Tribute 2/Bello/ Volt/ Escape/Stylo/Aspire, LG G Pad X and many more. 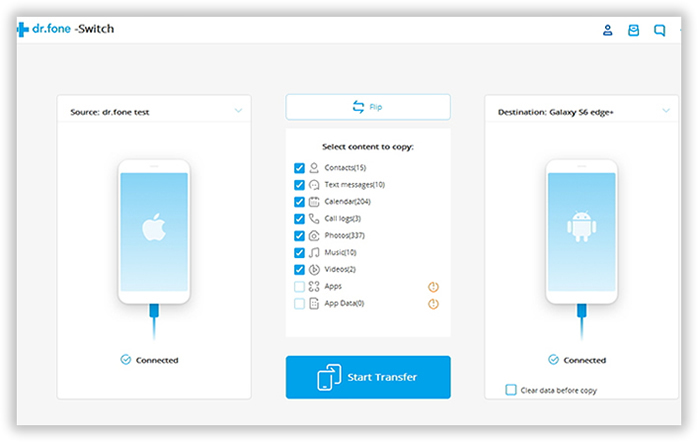 Supported Files for Transfer: Text Messages, Contacts, Music, Video, Text Message, eBooks and Documents. Click the download button to save the installation file on your computer. It can be a Windows PC or Mac. In this example, we take Windows version as a demo. After that, install the program on your computer by following the wizard. Launch the program at the end of installation. From the start window, you can see there are 8 options listed. In our case, click 'Switch'. First insert LG phone into the computer with USB cable, then do the same for iPhone. After they are connected, the program will automatically detect your phones in a minute. Please note that, the source is the one you need to copy messages from and the destination is the one who receives the messages. Click 'Flip' button to change positions if wrong. They are various types of data which can be copied from Android to iPhone. All of them ae displayed on the central of the program. Make SMS checked and click 'Start Transfer' to begin the SMS transfer process. However, you are free to choose the data you wish to transfer. In a few minutes, all the selected messages on LG phone will be moved to your iPhone. Phone to Phone Transfer has a user-friendly interface which is easy to navigate. When you launch it, the main window will automatically display the source and the destination device, in this case the LG phone and iPhone. That is why data transfer between any two phones will become a piece of cake when you use the program. 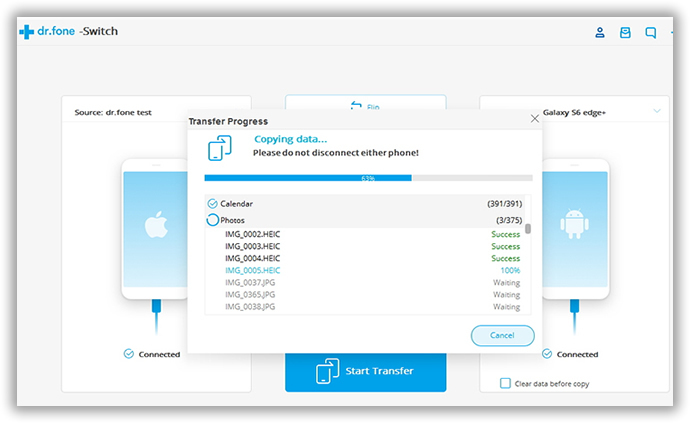 You can now transfer data from your LG phone to your new iPhone without worrying about any data loss with the use of this phone transfer software. This is efficient as well and very straightforward. We will help you get started, just follow these steps and you will be able to transfer your messages from your LG phone to your new iPhone in no time. Having this program on your computers will be very helpful because you can also save your mobile data in your computers using this program. 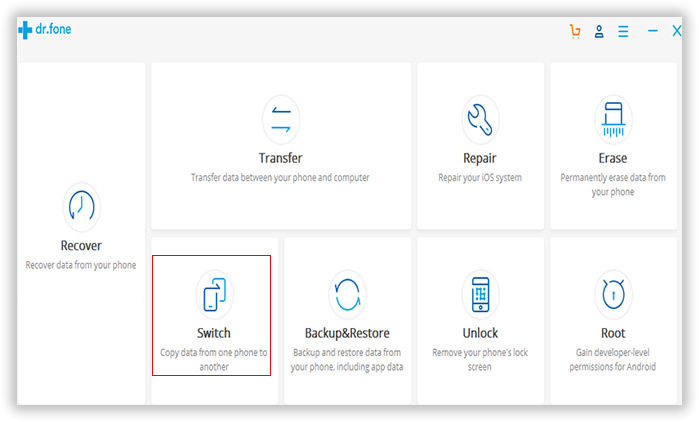 Now, you can make your computer as a backup for your mobile data.